Disclaimer: This product was given to me for review purposes. I am not being paid to post this review. All of my opinions are honest and to the point. I am not affiliated with this company. Hello, lovelies~ Continuing the series of review from L'Occitane's Angelica skincare line, next up is the exfoliating gel or scrub. Same as the previous one, because mine is a sachet sample, I won't talk about packaging. You may see two types of alcohol placed high up in the ingredients list; Arachidyl and Myristyl Alcohol. Fret not because they are cousins of the cetyl and stearyl alcohol, which is emollient in nature and won't dry out the skin. Unlike Alcohol, Ethanol, or Isopropyl Alcohol. Too bad it still contains fragrances and colorants, despite the absence of parabens. 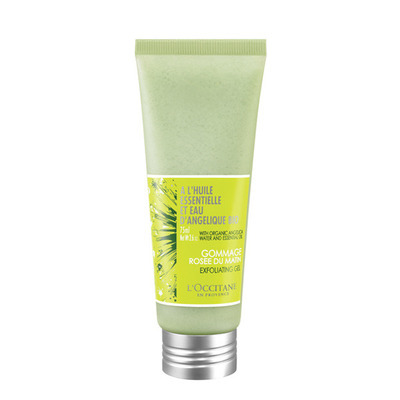 The product is a fresh-scented, green, cream exfoliating gel that has micro-balls or microbeads. They are cute, small, round, transparent, plastic-like balls that help to scrub away dead skin cells found on the skin. I think it is interesting how the micro-balls are shaped like real transparent balls. Here I thought, it was only in the description to make it sound good. The arrows show the micro-balls. When I massaged it on my damp face, I feel that the micro-balls aren't harsh at all. I was scared that this may be a natural-type scrub that has uneven edges, but the scrubs are actual ball shaped as you can see in the picture. It takes off the flaky dry skin off my face in a gentle exfoliation process and didn't produce a taut sensation afterwards. One of the micro-ball up close. I would say this is my favorite product from the Angelica skincare line, with a gentle exfoliating beads balls that eliminates dry, flaky skin without being harsh on my face. This product can be used two to three times a week because of the gentle properties of the scrub. However, it is on the pricier side, retailing at Rp 335,000 for 75 ml of product.